New Delhi: Advertising expenditure in India is expected to grow at 13% to touch Rs69,346 crore in 2018 over 2017, according to a forecast by WPP-owned media agency GroupM in its report This Year Next Year (TYNY). This is higher than 10% that GroupM put out for 2017. The report, released on Tuesday, stated that the ad spends in 2018 will be driven by a recovery in consumer demand and private investment after the implementation of key reforms such as bank recapitalization, budget provisioning of non-performing assets and the Bankruptcy Bill approved by law. Sectors such as fast moving consumer goods (FMCG), auto, telecom, technology, e-commerce and banking financial services and insurance (BFSI) will contribute to the ad spend growth this year. Among media channels digital continues to be the fastest growing medium registering 30% growth rate to reach Rs12,337 crore. It will command 18% of the overall advertising spends. Within digital, video advertising is estimated to grow at 54% with improved bandwidth, penetration of cheap data and affordable mobile devices. India continues to be one of the few large markets where all traditional media platforms will grow, the report said. Television advertising is expected to grow 13%. 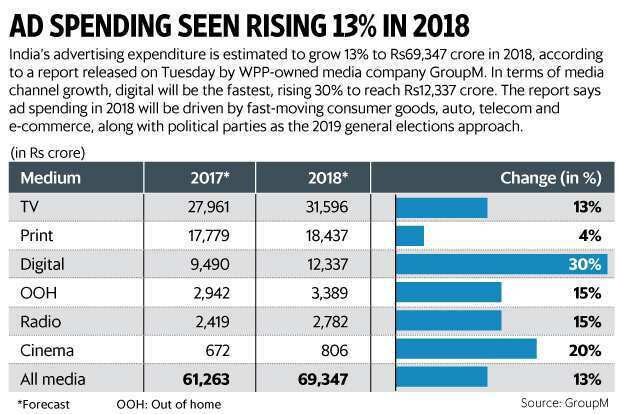 Meanwhile, print will witness a modest growth of 4% with increase in ad spends from political parties in the second half of the year owing to 2019 general elections. It would be an interesting year for radio which is expected to grow at 15% with an increasing number of radio stations launched under Phase-3 of radio privatization. “Digital will contribute 18% to the overall adex and we predict that this share may go up to 25% in the next three years. Television, which came under pressure last year, will bounce back. Print’s overall share has declined marginally with spends slowly moving towards digital. Meanwhile, cinema, outdoor and radio put together is under 10% of the overall ad spends but we expect decent growth in these mediums. The biggest takeaway from this report is that there is still positive growth across all media formats. It will take a while before India starts mimicking the more developed markets where most of the spends have moved to digital," said C.V.L. Srinivas, country manager, WPP India and chief executive, GroupM South Asia. Srinivas further added that after a couple of sluggish years, rural volumes are expected to pick up this year leading to increased marketing budgets. “We believe that the 13% growth in ad expenditure forecast by GroupM looks promising based on current trends. An upward correction can be expected due to rapidly increasing Internet penetration, affordability of digital devices, and the various initiatives taken by the government to increase Wi-Fi connectivity in public places and for digital India," said Ahmed Aftab Naqvi, chief executive, Gozoop, an independent digital marketing agency. Apurva Purohit, president at Jagran Prakashan and director at Music Broadcast Ltd which runs Radio City said that radio’s projected 15% growth is significantly higher than previous years. “Radio’s demonstrated ability to strike a personal connect with users coupled with its reach, and the fact that it is seen as the most trusted and credible medium for information is being recognized by advertisers and is driving this growth," she added.